Roundtable Contributors: Princess Fee (DF’82), Estelle Hallick (This Happy Place), Alan Mize, Blake Taylor (BlakeOnline.com), Andrew (Disney Hipsters Blog), and yours truly. The most recent reader's poll from Conde Nast Traveller Magazine has placed Disney Cruise Line in the top 3 out of the top 10 large cruise ships! Coming in at number one was the Disney Magic, followed by Disney Wonder, Disney Dream and then Disney Fantasy was also placed in the top 10, coming in at 8. With the Magic being such an in-demand ship, and the Fantasy the newest of the fleet, these positions are probably not too surprising for the Disney Cruise Line. Although I have not yet to experience any of the ships, this has made me even more keen to try these beauties! Say goodbye to Mickey and Oswald the Lucky Rabbit. At least in the world of Wasteland, that is. In 2007, the Disney Company acquired the software company Junction Point. 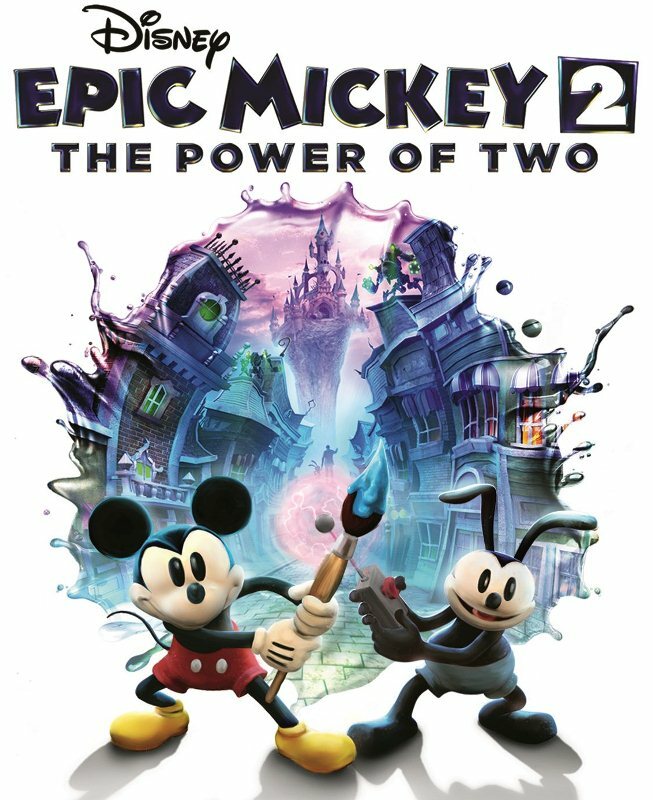 This acquisition led to possibly the best Disney video game since the Kingdom Hearts franchise, “Epic Mickey.” Disney announced earlier this week that they will be closing the doors to Junction Point which means “Epic Mickey 2: The Power of Two” will be the last of the Epic Mickey series. 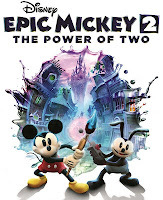 Granted, there were no rumors that more would come and the less than stellar sales of the sequel probably didn’t help the odds, but this news officially closes the book on the Epic Mickey story. Personally, I really enjoyed the first game on the Nintendo Wii. I thought it was fun, creative and original. I loved the way it played off of the environments of Disneyland that I know and love. It took Main Street, USA and Tomorrowland and twisted it around to show a dilapidated world where cartoon characters go to fade away. I was also happy that the game gave me my first glimpse at Walt’s long lost friend, Oswald. I knew the history of the creation of Oswald and how Walt lost the character in the first place. I also knew how Disney essentially traded a football announcer to get Oswald back into the family. But this was the first time that I got to see Oswald in action and I’m glad I got the opportunity. With the announcement of the new Disney Infinity interactive game that I talked about a few weeks ago, it was inevitable that something get put on the chopping block. Despite the fact that the Epic Mickey franchise is done, perhaps the success of the first game will convince Disney that Oswald needs a more permanent place in the Disney environment. 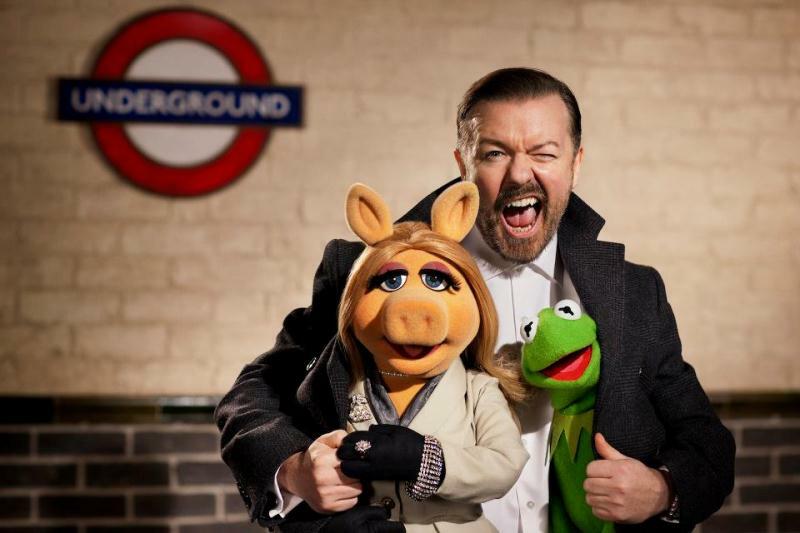 The Muppets Take London... Again! After all the hoopla last year surrounding Epcot's 30th, Tokyo Disneyland's big day has been shrouded over a little bit. Always seen as the forgotten park by enthusiasts, considering its hodge podge nature, the event is no less momentous. To celebrate the milestone birthday this years promotion is known as The Happiness Year (as if the other years have been totally devoid of happiness...) and includes a special parade, merchandise, and the updated Star Tours (seriously, how is this special?) One of the bright spots in this promotion are the fabulous special costumes that Mickey and the gang will be wearing for the year! Lots of gold and fun...but regardless, why aren't they getting more? The past few years have seen a surge in behind-the-scenes books that give Disney fans the unique opportunity to peruse pages brimming with knowledge, insight, and wonder behind the magic we all love so much. However, it's often that these books are not heavily advertised, even with the excess of social media present today. For this reason, I occasionally explore Amazon to see if anything new is on the books (pardon the pun) from Disney's professional publishing arm, Disney Editions. And wouldn't you know it, such a title is coming up very soon. Releasing on February 26 and written by Ted Kinni, The Disney Difference will examine Disney's expert guest services, "from expression and brainstorming to organization and people management," as quoted from the book's Amazon page. Disney is notorious for its strive to give families a near-perfect quality experience, so this book should hit home not only with the Disney-buff market, but also in business people working toward infusing excellence in their company. Interestingly enough, a similarly themed book, Be Our Guest: Perfecting the Art of Customer Service, also written by Kinni, was first published in 2003 and just received a revision in late 2011. I'm curious how that book, while wonderful, is different from this new title. No matter, The Disney Difference should be a fun read, and is one that I'm looking forward to. 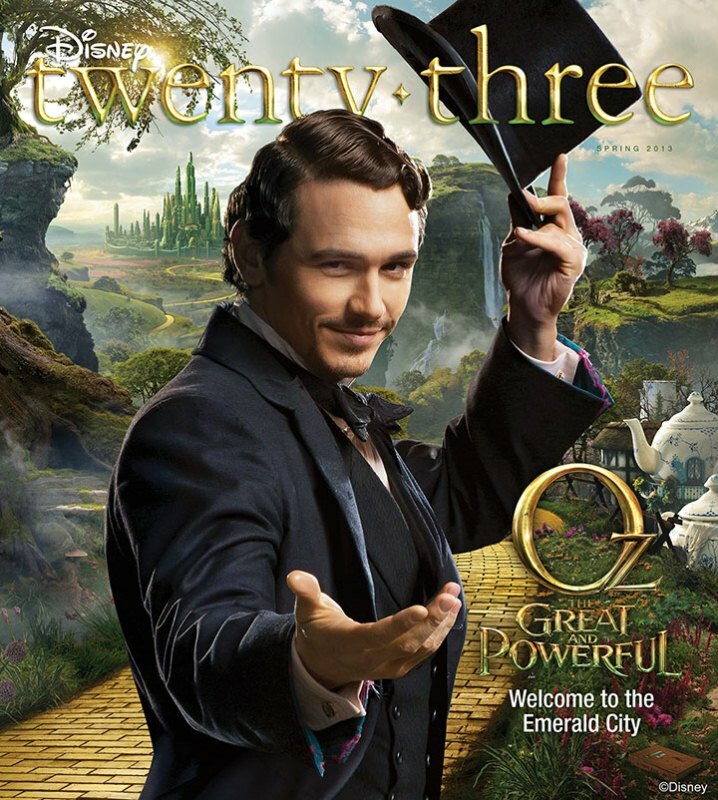 The spring issue of Disney twenty-three is heading to newsstands on February 12 with a cover promoting the upcoming feature film, Oz The Great and Powerful. Oz will be celebrated not only for this new movie, but also a look back at Return to Oz. A look at another glistening world coming to film, Frozen, is also highlighted in this issue. Plus tales from puppeteer Bob Baker, the 30th anniversary of the Disney Channel, and the Arribas brothers. However, the article I am most looking forward to is the interview with Joe Rohde looking back at fifteen years of Disney's Animal Kingdom. As many of you know, I am continually falling in love with the youngest Walt Disney World park all over again after each exploration. Disney's Animal Kingdom is a fount of knowledge and story that continue to grow together. If there is one person who understands the ins and outs of this park and truly sees the big and little pictures found throughout, it is Joe Rohde. I had the pleasure of listening to him talk about the Disney's Animal Kingdom, the development of its message, icons, and how the land and structures must work symbiotically when the park celebrated its first decade five years back. For those of you interested, you can find a transcript of Rohde's lecture on the Main Street Gazette. 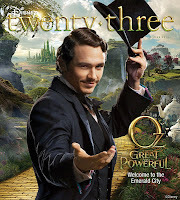 Between Disney twenty-three and the supporting web content, including a talk with Brian Henson about Return to Oz, and an off road look at Kilimanjaro Safaris, there is a lot to look forward to in this next issue. Joe Rohde may be the driving force behind my rabid reading of the upcoming issue, but there is something here for everyone to find some simple joy in! When it comes to Beaches and Cream at the Beach Club, we’ve long been partial to Frozen Sunshine for its delicious blast of citrus. 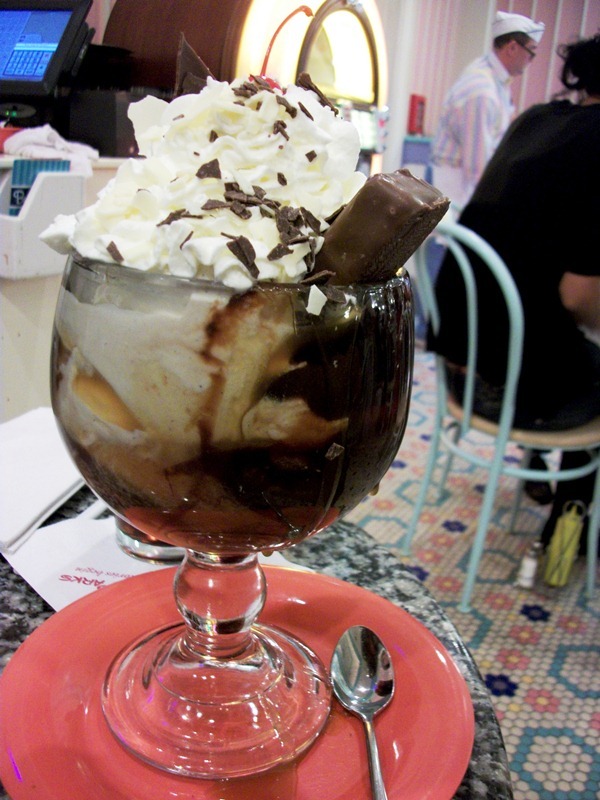 The most commonly mentioned treats on Beaches and Cream’s menu, however, tend to be the Kitchen Sink or No Way Jose. Recently, we decided to sidestep our usual while still trying something not everyone is talking about. The result? We ordered the Milky Way Sundae and were introduced to this behemoth. Once upon a time, the sundae was served atop a Bundt cake, but now it is all ice cream and toppings all the time! So, what makes up this cool concoction? Start out with three scoops of vanilla ice cream and then drown them in hot fudge and caramel. Add a mountain of whipped cream, decorated with dark and white chocolate shavings, and top with a cherry for good measure. Oh yeah, and throw in a miniature Milky Way bar just for kicks. That’s how you put together the Milky Way Sundae. When I sat down with this intergalactic ice cream treat it took me a few moments to try and find a plan of attack. Rather than think it through and let it melt, I immediately devoured the cherry and mini Milky Way. As the whipped cream was so tall, it made it tough to get any ice cream with it, but the chocolate shavings made it just that much richer. The combination of the fudge, caramel, and vanilla ice cream was luxuriousness on a spoon. Seriously! Both toppings were amazingly thick, and the intensity of the fudge and the sweetness of the caramel pleased all the right spots on my palate. Oh, and when it was just a soup of melted ice cream, fudge, whipped cream, and caramel? Yep, I slurped that delicious brew as it was really just a top tier, milkshake at that point. The next time I’m at Beaches and Cream I’ll probably go back to my old standby, the Frozen Sunshine. Then again, the Milky Way Sundae has managed to scoop out a special place in my heart as well now. Beaches and Cream prepares some of the best sundaes around, and this dish has rightfully earned its place among the rest of the menu! It seems like watersports, from fishing to motoring about in miniature powerboats, are the cornerstone of Walt Disney World recreation. However, from the moment the resort flung open its doors, there have been a host of carts lined up to take a swing off of tees of the golf courses around property. 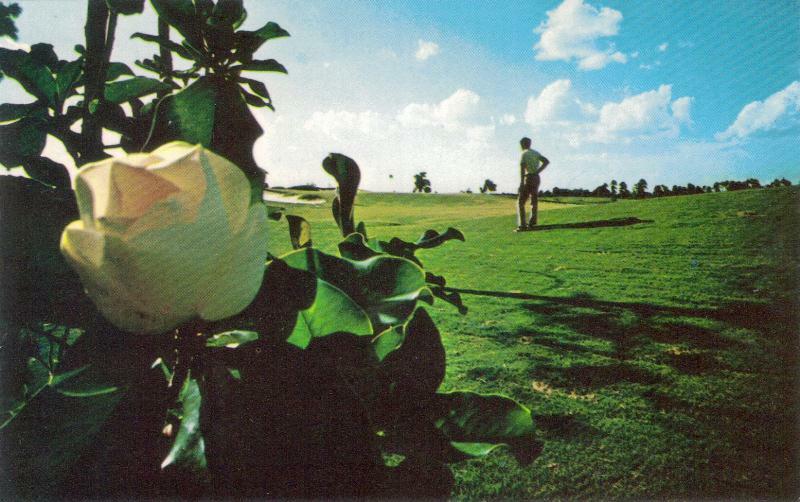 If golf was your main drive for coming to the Vacation Kingdom, the opening of the Golf Resort in December of 1973 gave you the perfect place to stay and play. Early plans for Walt Disney World called for Venetian and Asian resorts to join the Contemporary and Polynesian on the shores of the Seven Seas Lagoon. With the two resorts running at almost one-hundred percent capacity every day of the year, there was a definite need to find more rooms to keep guests on property in the early 1970s. While these planned resorts seemed to be the perfect answer to the room shortage, the next resort to open was 1973’s Golf Resort. The two story clubhouse that serviced both the Magnolia and Palm courses would gain wings filled with 151 rooms overlooking the wilderness and fairways that comprised the two courses. The luxury accommodations featured 480 square feet rooms that felt more like suites. Well, you had to have somewhere to stash your families’ clubs, right? The Golf Resort, while perfect for golfers, left something to be desired by the park-going vacationing set. Mainly, the fact that the resort was not attached to the monorail loop. 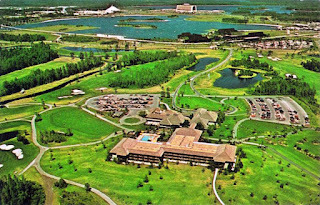 The resort also opened in the wake of the oil embargo, which certainly did not help with the number of guests coming to visit not only the Golf Resort, but Walt Disney World as a whole. Even after guests began returning to Walt Disney World, the company was focusing on other projects, namely EPCOT Center, and not worrying about resort rooms. In fact, Disney’s Caribbean Beach, which opened in October of 1988, would be the next resort that would open on property. 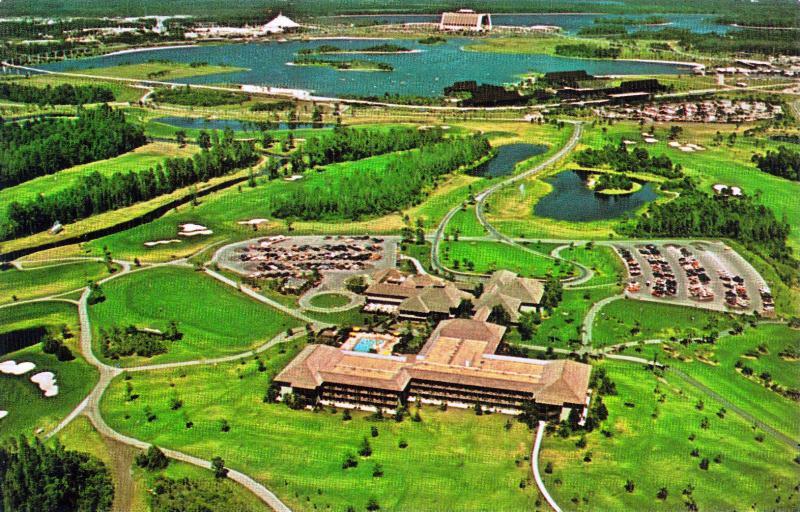 As for the Golf Resort, it was rebranded in 1986 with the inclusion of additional rooms and became known as The Disney Inn. A short eight years later and the resort underwent another shift. The resort became known as Shades of Green in 1994 and was leased to the Department of Defense for the next 100 years. Shades of Green is currently home to 606 rooms for use by active and retired military personnel and their families and is the only Armed Forces Recreation Center (AFRC) in the continental United States. What started out as a dream of Card Walker has become a welcomed respite for our military families. Shades of Green is still nestled between the two courses that predate the Golf Resort, with the addition of a nine hole walking course. While not as lavish as the Asian or Venetian might have been, I can’t help but think that the Golf Resort would have been a quiet place to stay with some gorgeous views from the rooms’ balconies in those early years. You may have heard this before, but a lot of my emotional bonds to Walt Disney World come from my father. As a child he was the one who talked me out of a birthday party to go to see fireworks and as a teen, long after my mother and sister stopped going with us, he was the driving force that carried he and I to the parks on a regular basis. His favorite park is, without a doubt, Epcot and his favorite pavilion there is The Land. Just as I would not take no for an answer when it came to Horizons, he stood his ground on Listen and Living with the Land. His fascination with the technology of this pavilion propelled me, as a teenager and later as a young adult, to foster my own respect for the science, love of the pavilion, and rabid curiosity. 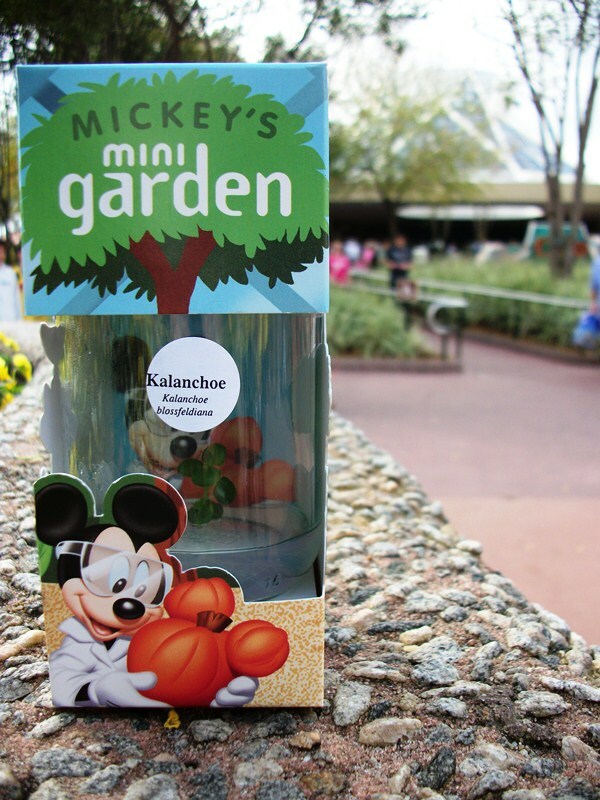 For the longest time he and I have stared at the Mickey’s Mini Garden displays, filled with tiny plant cultures that guests can take home, and wondered how they do it and more importantly how could we take one home and not kill it overnight. The Land’s Behind the Seeds Tour offered up a few answers as to the ‘how do they do it’ question, but we’ve both been hesitant to take home our own sample and try to grow it. Let’s face it, for a pair of dyed-in-the-wool Epcot enthusiasts, letting one of these cultures die would be like killing off a piece of Epcot with our bare hands! Earlier this month I found myself staring at the same display on the counter of Green Thumb Emporium, the hole in the wall gift shop in front of the entrance to Soarin’, facing the same dilemma. There is also a terrific little notebook sitting on the counter for the curious that is filled with planting instructions, information on available and unavailable plants due to planting cycles, and even specifics for those concerned about upsetting TSA with this tube in their luggage. After checking out the current available plants and sifting through the ease of transplant, growth, and needs of the individual plants, I mustered up all the courage I could and picked out a rather nice looking Kalanchoe culture and brought it home with me. 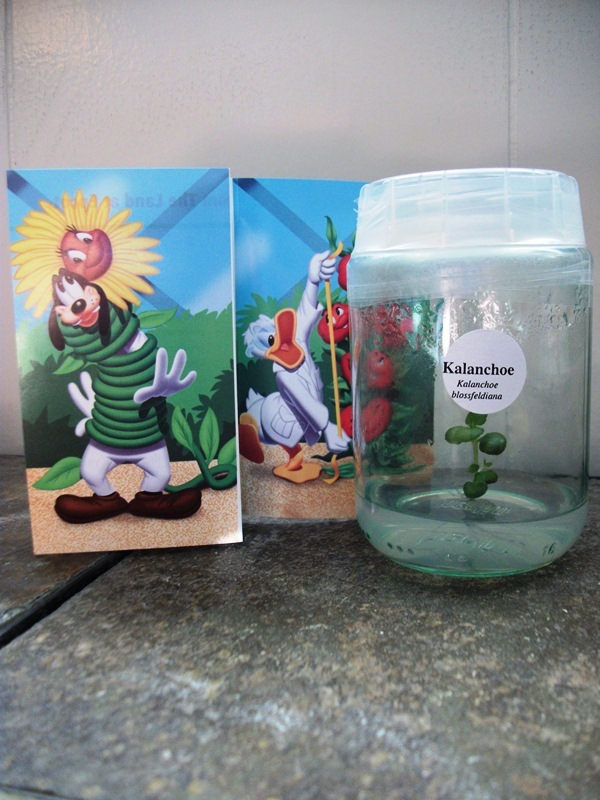 Kalanchoe is a succulent plant that can grow up to eighteen inches and has pink flowers. It can grow in full sunlight or partial shade and was listed as ‘Easy to transplant’ and ‘Easy to grow,’ which made me hopeful that it would survive my not-so-green thumb. I’ve allowed it to stay in its tube for the past couple of weeks as we have had some bitter cold here, as most of you have as well. Yesterday, however, I decided it was time to go ahead and give the transplant process a go. Here are the directions provided by the minds of The Land’s living laboratories, I’ll be back later with a few insights. 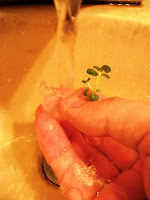 1 – Remove it carefully from the test tube without damaging the roots. Gently wash off all the gel under cool running water. Work quickly so your plant doesn’t dry out. 2 – Plant it into sterile potting soil in a small 4-6” pot. Lightly water it. Don’t water it again until the soil surface is dry. 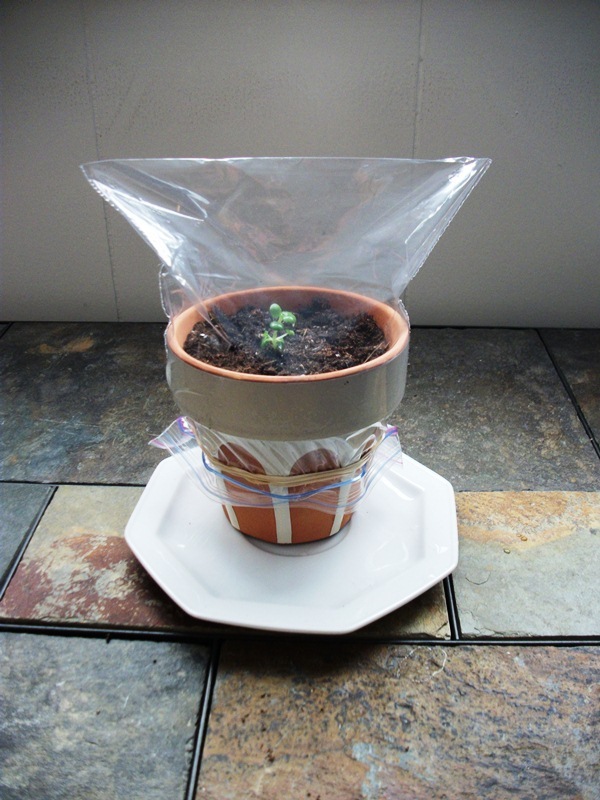 3 – Keep the humidity high around the plant by covering it with a plastic bag, and sealing it around the pot with a rubber band. 4 – After about two weeks poke tiny holes in the bag to let in fresh air. Gradually let in more air over the next two weeks by making the holes larger. Remove the bag once your plant has adjusted to its new environment and has begun to grow. 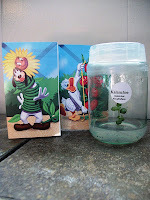 5 – As the plant gets bigger, transfer it into a larger pot. Handle this plant as you would any other transplant. For information specific to your plant and local growing climate search online or contact your local extension office. Obviously, as I have just transplanted the culture from the test tube to the pot, I’ve only reached step 3, but here’s what I’ve found out about the plant and myself. I did some searches for ‘sterile potting soil,’ and the best results I found required having to bake potting soil in my oven. I’m really pulling for this little plant, but I’m pulling even more to not have to sleep on the couch, so I decided that a fresh bag of potting soil would be preferable to stinking up my house with baked potting soil. I did, however, make sure to find a soil that was supposed to help cuttings. The size of the plastic bag wasn’t specified, but as it was meant to keep in the humidity, I opted for a sandwich Ziploc bag. Time will tell if that will work, although I’m not sure about when to water as the soil is supposed to be dry, and I can’t get a good sense of it through the plastic bag without removing it.